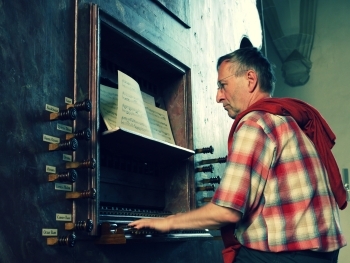 This organ with eighteen stops, two manuals, and pedal was built in 1760 by Jan Výmola. Restored by Dalibor Michek in 2009–2013. When I started to think about making a recording on the organ in Doubravník, I wanted to take inspiration in my choice of composers and works from what we hypothesize about the music being composed and about organ practice in the region in question at about the time the organ was built. In other words, I wanted to perform music of the kind being most frequently performed in the region, i.e. in classical, mostly homophonic style. This was also the predominant style almost everywhere else in Europe. 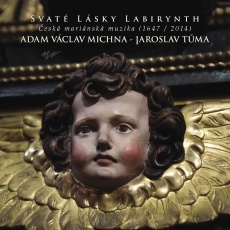 Strangely, however, when these kinds of pieces are played on Výmola’s organs, they are not especially pleasing either to the organist or to listeners. In Doubravník, the music of earlier ages sounds far more impressive, although it generally would not have been played much anymore at the time when construction of the organ there was finished. Such music was neglected, being regarded as too complicated and old-fashioned. The tastes of the times had long since headed in a different direction. Geographically, Výmola’s Brno is close to the capital city of the monarchy, Vienna, so there is no reason to assume that the organ builder was predisposed towards conservatism. 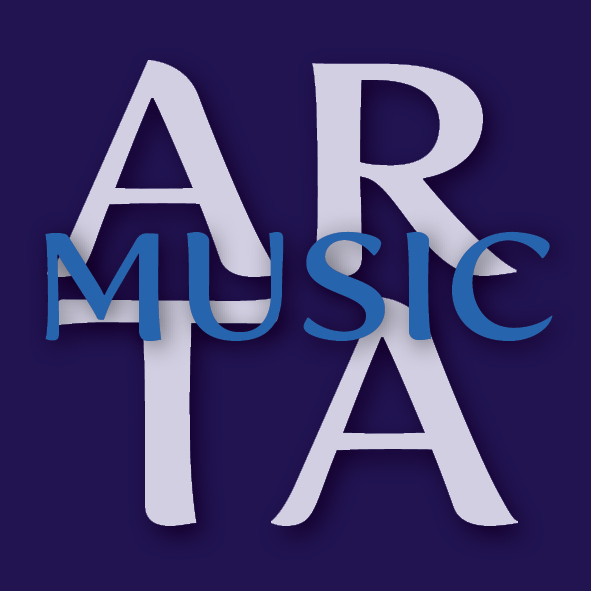 It is certainly clear, and we have much evidence to support the assertion that the making of organs often follows well-worn paths and customs, not only in terms of design and construction, but also purely with respect to sound, even when innovations in the progressive development of musical creation are headed in a completely different direction. 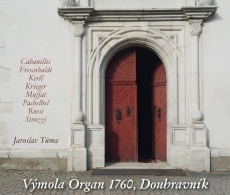 In the case of Doubravník, however, the special appropriateness of the sound of the organ from 1760 for music written even a hundred years earlier is perhaps overly obvious. I would hesitate to speculate about all of the causes for what I have discovered, but it is certain that we owe this fact in part to the unusual design of the Doubravník organ, thanks to which it is possible to play older literature in Doubravník by composers not only from Germany, but also from Italy and Spain. For example, the work by Cabanilles uses the organ’s only reed stop, while the pieces by the Italian composers Strozzi and Frescobaldi use Bifara, which is tuned against the principal of the Great division to produce a vibrato effect, like the Voce Umana of Italian organs. 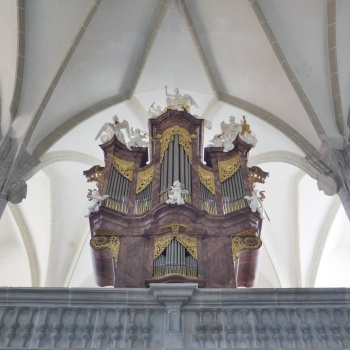 The uneven tuning of the Doubravník organ is supremely functional and enormously aesthetically effective, congenially resonating with the church’s Gothic architecture. The dramatic chromatic chords in Rossi’s Toccata and the Neapolitan sixth chords with the tones c, e flat, and a flat in the Passacaglia by Georg Muffat offer the clearest evidence of this. Of course, I have chosen to play these compositions not only because of the possibilities offered by the Doubravník organ’s design, but also, in particular, because I have repeatedly had the insistent feeling that although repertoire of a serious character does not usually sound sufficiently weighty on rural instruments designed on a smaller scale, I can rely on the organs built by Výmola to underscore splendidly the monumentality and inwardness of the repertoire I have chosen, and this is what I find to be unique about these instruments in the broader context of central European organ building. The recording was released in coopeeration with the Roman Catholic parish of Doubravník. 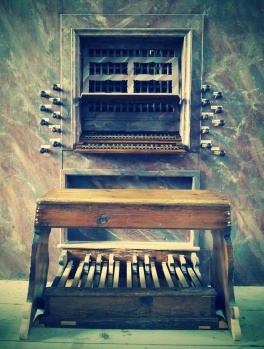 The organ in Doubravník is purely mechanical, with a slider soundboard. It lacks couplers for both the manuals and pedal. Its tuning corresponds to the length of the pipes, with “A” sounding at approximately 423 Hz at 15°C, which is nearly a half tone lower than current standard pitch. Fifth-comma meantone temperament was employed.